Hilton today announced the executive team for the new DoubleTree by Hilton Perth Northbridge, opening late December 2018. 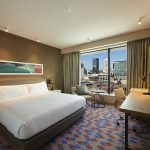 DoubleTree by Hilton Perth Northbridge, owned by SKS Group, will be the first DoubleTree by Hilton property to open in Western Australia and the first new-build DoubleTree in Australia. The hotel is located at 100 James Street, Northbridge, in the heart of the city’s vibrant nightlife, dining, shopping and cultural district, and within walking distance to corporate offices, Yagan Square, Elizabeth Quay and RAC Arena. The hotel will feature 206 guest rooms including Executive Panoramic View rooms, an executive lounge, James St Bar + Kitchen, 310m² of event space, a gym and an outdoor pool and bar. When staying at DoubleTree by Hilton Perth Northbridge, Hilton Honors Members will enjoy popular digital tools available exclusively through the industry-leading Hilton Honors mobile app, where Hilton Honors members can check-in, choose their room, and access their room using a Digital Key. The executive team will include Tamer ElGhamry as hotel manager, Rebecca D’Costa as commercial manager and Kevin Garcia as head chef of James St Bar + Kitchen. The current Parmelia Hilton Perth hotel general manager David Constantine will oversee the DoubleTree by Hilton Perth Northbridge executive team in his newly expanded role as cluster general manager. Tamer ElGhamry brings 24 years of Hilton experience to his role as hotel manager, where he was most recently the director of operations at Hilton Fiji Beach Resort and Spa. Immediately before his Fiji posting, Tamer was the director of operations at Hilton Beijing Wangfujing in China and prior to that, director of operations at Hilton Marsa Alam Nubian Resort in Egypt. Rebecca D’Costa joins DoubleTree by Hilton Perth Northbridge as commercial manager. She joined Hilton in 2009 as event sales coordinator and subsequently corporate sales manager and events sales manager at Parmelia Hilton Perth. Kevin Garcia has been appointed head chef of James St Bar + Kitchen after spending the last three years as executive chef at DoubleTree by Hilton Alice Springs where he oversaw the operation of two restaurants, Springs and The Deck. David Constantine brings over 40 years of Hilton hospitality experience to his role as cluster general manager; overseeing the operations of DoubleTree by Hilton Perth Northbridge and Parmelia Hilton Perth. “We are delighted to welcome our newly appointed executive team into their roles at DoubleTree by Hilton Perth Northbridge. 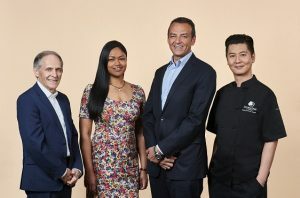 It is wonderful to see Team Members Tamer, Rebecca and Kevin continue their Hilton journey, and we look forward to seeing them bring their knowledge and experience to this exciting new property,” said Heidi Kunkel, vice president, operations, Australasia. At DoubleTree by Hilton Perth Northbridge, guests can expect all the hallmarks of a DoubleTree by Hilton stay that create a rewarding hotel experience, from the signature, warm chocolate chip Cookie and its world-renowned warm welcome.